When selecting roofing materials to install on low-slope buildings, you have many options, including commonly used asphalt. However, one roofing material stands apart from others in terms of its environmental benefits: vinyl. A black asphalt roof’s surface temperature can rise as much as 90 degrees Fahrenheit above ambient temperature in the mid-day sun, raising a building’s internal temperature and requiring significant amounts of energy to keep it cool. In comparison, a white reflective vinyl roof’s surface temperature generally increases by only 10 to 25 degrees above ambient temperature in the midday sun, substantially reducing a building’s energy requirements. A federal government-funded study conducted by Lawrence Berkeley National Laboratory, Berkeley, Calif., found that, compared with an existing black rubber roof on a retail building in Texas, a new vinyl roof installed on the same building provided an average 42-degree Fahrenheit decrease in surface temperature and a 14 percent decrease in peak air-conditioning consumption. Such reduced energy costs can result in significant savings for building owners and help reduce greenhouse gas emissions. Federal, state and local governments are recognizing reflective roofs’ energy-efficiency and carbon emission reduction benefits and are offering a range of incentives for installing reflective roof systems, such as vinyl roof systems. For example, the Emergency Economic Stabilization Act of 2008 extends the benefits of the 2005 Energy Policy Act, which gives a tax deduction for energy-efficient commercial buildings with qualifying systems, through Dec. 31, 2013. The American Society of Heating, Refrigerating and Air-Conditioning Engineers Inc. recognizes thermal insulation and reflective roofing as the two roofing technologies pertinent to this requirement. The deduction is equal to the costs of the roof—up to $1.80 per square foot—for buildings achieving 50 percent energy savings. The Database of State Incentives for Renewables and Efficiency is an excellent source for additional information about government rebate and incentive programs, including those that apply to reflective roofing technology. 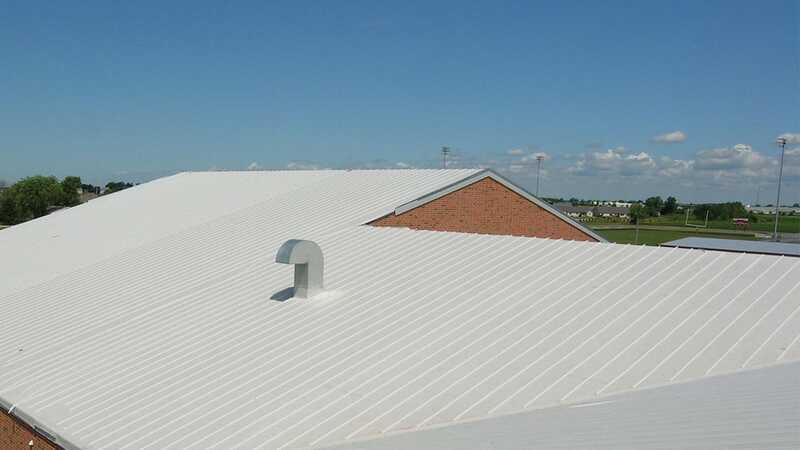 Vinyl roofing materials also can be used with vegetative roof systems. Vegetative roof system components often include a root-resistant vinyl waterproofing membrane, drainage system, filter cloth, lightweight growth medium and variety of plants. Once a vegetative roof system is installed, energy savings can be substantial. A Canadian government study found that a one-story building with a vegetative roof system with 3.9 inches of growth medium had a 25 percent reduction in summer cooling needs. Another study, “Thermal Performance of Green Roofs in Canada,” showed that a 6-inch-deep intensive vegetative roof system reduced heat gains 95 percent and heat losses 26 percent compared with a nonvegetative roof. The benefits of vinyl reflective roofing materials and membranes are clear: significantly reduced energy costs, carbon emission reductions, access to a range of government incentives, durability and more. Whether you are performing new construction or an existing roof replacement, consider installing vinyl roofing products. Doing so could benefit the environment and your customers’ pocketbooks. Patrick Moore, Ph.D., is chairman and chief scientist of Greenspirit Strategies Ltd., Vancouver, British Columbia.